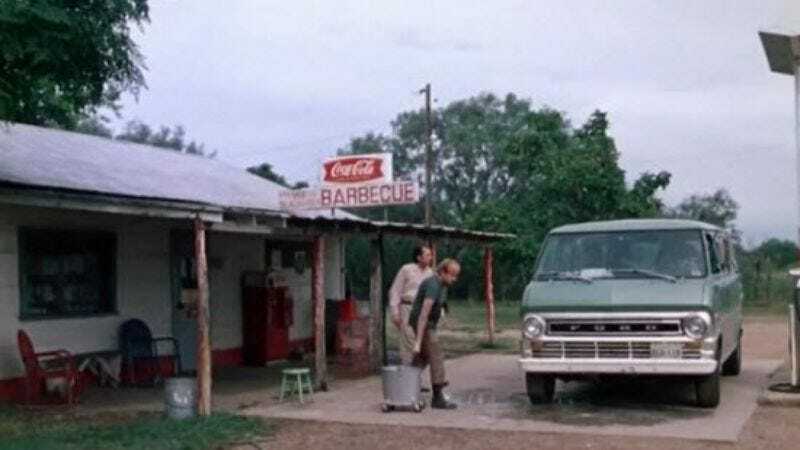 The actual house where Leatherface honed his cannibalistic culinary skills in the original Texas Chain Saw Massacre may no longer be a restaurant—as it was when The A.V. Club visited it as part of our Pop Pilgrims feature—but movie lovers looking to indulge in some ironic meat-eating will soon have another option. Rolling Stone reports that Roy Rose, owner of the Last Chance Gas Station in Bastrop, Texas, has announced his intentions to turn the place into a “horror barbecue resort.” Rose, a horror fanatic and apparent member of the Juggalo fam, bought the gas station from its original owners last January. Going by the name We Slaughter Barbecue, the attraction will include not only a music venue (crossing fingers for a Black Roses theme) and Texas-style barbecue restaurant—which one can only hope will serve dishes with names like “Baby Back Ribs” and “Smoked Pam Sandwiches”—it’ll also have cabins out back where weirdos in Motel Hell T-shirts can go collapse for the night after eating too much brisket. That’s where investor Ari Lehman, who played Jason Voorhees in the original Friday The 13th, presumably comes in.